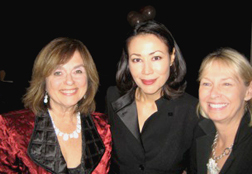 AWC-SB founding members Lois Phillips and Deborah Hutchison enjoyed meeting Journalist Ann Curry (center), recently promoted to anchor of the NBC Today show. Ms. Curry delivered the keynote address at the last conference in Seattle, WA (2009). The 2011 AWC national conference, Navigating the Communications Highway, in Tulsa, OK, will be held in October. Rooms are going fast! This entry was posted in News Articles on August 6, 2011 by awc sb.